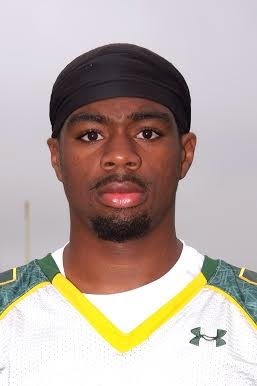 MAC Football News: DelVal Football - Rasheed Bailey Featured In Sports Illustrated's "Faces in the Crowd"
DelVal Football - Rasheed Bailey Featured In Sports Illustrated's "Faces in the Crowd"
DOYLESTOWN (PA) – Delaware Valley College senior wide receiver Rasheed Bailey is featured in the “Faces In The Crowd” section in the October 27 edition of Sports Illustrated that just hit newstands. It will also be available for online viewing on Monday www.si.com/faces. Bailey is one of seven student-athletes from across the country to be featured in the section, which appears on page 18. The front cover of the edition features LeBron James and two of his new Cleveland Cavalier teammates for the NBA preview. Bailey, a senior wideout at Division III Delaware Valley College, broke the school’s receiving yardage record with 252 in a 56-24 win over Albright, and he tied marks for receptions (11 to beat Montclair State 30-20) and touchdowns (four in a 59-41 defeat of Lebanon Valley). 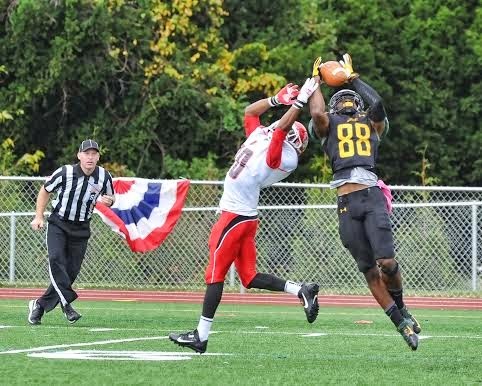 He leads D-III in receiving yards (1,053) and is second in TD catches (12). Bailey is the first Delaware Valley football player and the third overall from the school to be featured in Sports Illustrated’s “Faces In The Crowd.” National Hall of Fame wrestling coach Robert Marshall was the first as he was featured after his 400th career win in 2002. Men’s basketball standout James Jones received the honor in 2010 after he set a NCAA Division III record for consecutive free throws made during the team’s run to their first-ever Freedom Conference championship and NCAA playoff bid. Bailey and the Aggies are a perfect 6-0 (5-0 Middle Atlantic Conference) on the season and they will host Misericordia University for a conference game on Saturday, October 25 (1:00 p.m. kickoff).